Ah Pompeii...the tragic story of a city buried beneath the stone and ashes Vesuvius. Lucia betrothed to a man old enough to be her grandfather. Tag, a young medicine man, a slave who just wants his freedom. Returning to Pompeii after spending 3 years in Rome. Things arent the same in Pompeii anymore, the earth is doing strange things and Lucia seems to be the only on concerned about it. This is young adult at its finest. Filled with romance, drama, mystery, curses and secrets I had a hard time putting this book down. 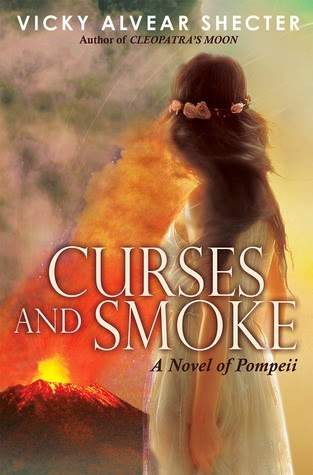 The author knows her history of Pompeii and it shows in this book. Lucia and Tag are both likeable characters and there is depth to their stories. The plot, yea it was really good too. The author notes are always a favorite part of a good HF read and I was not disappointed. Explaining her sources and why she wrote what she did. Definitely a great way to end my reading for 2014.